Many people like to go to online MTV channel, for example MTV.com, to enjoy the latest/hottest/favorite MTV videos. However, it is such a pity that you can only enjoy them online. Those wonderful MTV videos cannot be saved automatically. If you want to enjoy them on your iPod Touch or iPad, iPhone 4, what will you do? Some people may go to Internet to find some FLV Recorder. Unfortunately, most of these recording tools cannot grab and download the correct video clips successfully. As we know, those music shows in MTV.com are Flash format, and be of RTMP protocol. Therefore, you need to find a professional FLV Downloader. 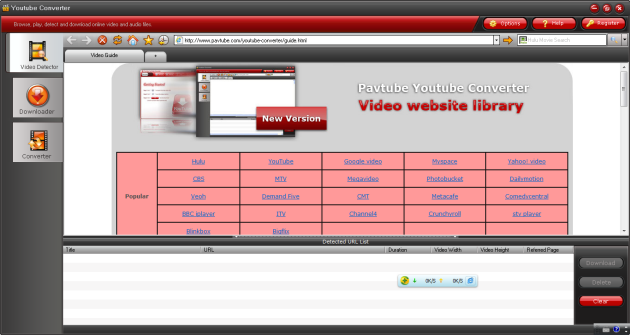 Pavtube YouTube Converter is such a great MTV FLV Video Recorder & Converter. It will auto-grab and download those MTV videos while playing. What’s more, it is a good MTV video converter that can help you directly convert FLV files to MP4, AVI, 3GP, WMV or other format that you need after downloading. It is an all-in-one downloader. Now please follow the guide below. Step 1: Free download the powerful MTV Downloader here. Install and run it. Step 2: Go to MTV.com. Click MTV in Pavtube Video Website Library to open the site. The Website Library covers almost all popular video-sharing website, so you don’t need to enter the address any more. Step 3: Capture URL of the online MTV video. When you are previewing the MTV Flash videos, the MTV Recorder will auto-capture the URLs of the music videos. Then you can choose the one you want to download and convert. Step 4: Create MTV download & Conversion task. Click to create new download/conversion task. Then a New Download window will pop up. Save to: Set the output folder to save the downloaded files. Library: Choose where you want to save the download MTV FLV in library, movie or music. Convert to video: Enable “Convert to video”, the program will download and convert the FLV video at the same time. Settings: Adjust audio and video parameters. File name: Rename the converted file name. Step 5: Start to download/convert MTV FLV video. Once all settings are done, click “OK”. Then the program will start to download and convert the web Flash Video. Then after conversion, you can find the converted MP4 MTV files in the destination folder. Now you can transfer MTV videos to your iPod Touch. You can also convert the streaming MTV videos to other format for playback on other devices like iPad, iPhone 4, Galaxy Tab, Galaxy S, BlackBerry PlayBook, BlackBerry Torch, etc. Free Download YouTube Video, YouTube Grabber , Free FLV Downloader, Download Google video, Save Metacafe Video from Internet, Dailymotion Flash video Free download, Capture streaming video for free, Save Flash video on PC, Download online video free, Watch FLV on iPod, Capture/Save Internet video, Download Flash Video, Free download NBA highlights, Download Halloween Prank Video from Website.